In the last half of the 1800s Confluence, which would become Orlando in the early 1900's experienced a second wave of new citizens, looking to build a life on the brand new land in the Appalachian hills. These 19th century immigrants had a very different world view, different values and expectations from the Williamses, Blakes, Skinners, Poseys Bennetts and Riffles who came from Maryland and eastern Virginia in the first half of the 1800s. These were Roman Catholic Irish who had fled the potato famine. Family names included Feeney, Moran, Dolan, and Carney, among others. 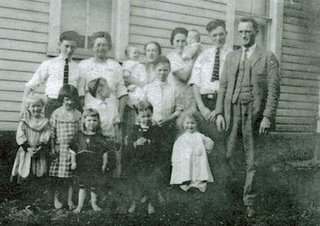 In his 1921 book, A History of Lewis County, West Virginia, E. C. Smith explains how this Irish/German group came to this area. Smith goes on the explain how the land merchants like Jackson, who owned the land in Collins Settlement, encouraged these bright, hard working folks to settle here. 1. John Vincent Carney 2. Kate (Moran) Carney 3. Eveyn 4. Margaret Moran 5. Addie (Kilker) Carney 6. Bobby Carney 7. Patrick Carney 9. Mike Moran 9. Roseanne Moran 10. Mary Carney 11. Justin Carney 12. John Kilker Carney 13. Agness Bernadine Carney 14. James Fabian Carney 15. Phyllis Moran.